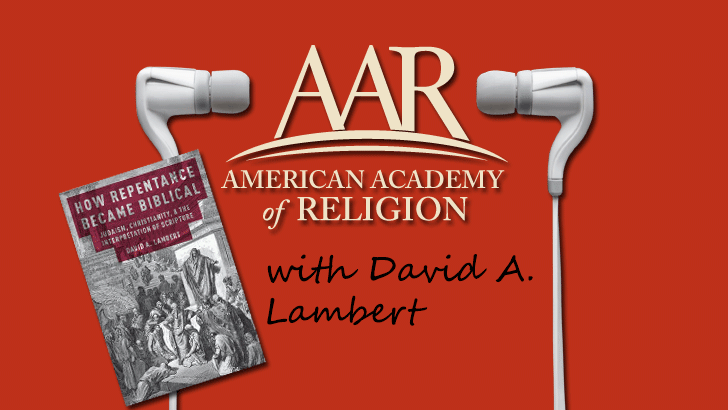 David A. Lambert talks to Religious Studies News about his book How Repentance Became Biblical: Judaism, Christianity, and the Interpretation of Scripture (Oxford University Press, 2015), which won the American Academy of Religion’s 2016 Award for Excellence in the Study of Religion in Textual Studies. Lambert's book "considers the development of repentance as a concept around the turn of the Common Era and how it came to be naturalized as an essential component of religion through a series of reading practices that allowed nascent Jewish and Christian communities to locate repentance in Scripture." Lambert is associate professor of religious studies at the University of North Carolina, Chapel Hill. Read the review of Lambert's book, by John Mandsager, in the Journal of the American Academy of Religion.